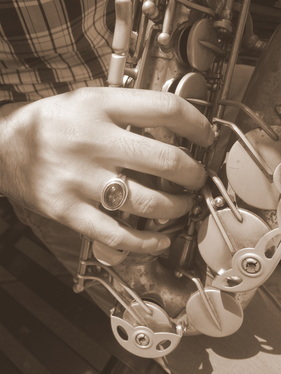 Chris Ruiz is a prolific saxophonist and music educator based in Boulder, Colorado. Originally from Texas, Chris holds a Bachelors of Arts in Performance from the University of Texas at Austin and a Masters of Music degree in Saxophone Performance and Pedagogy from the University of Colorado Boulder. He is an avid performer, regularly playing saxophone, clarinet and flute at venues in Denver, Boulder and throughout the northern Colorado area. He is at home in a wide range of musical styles including jazz, latin, classical, rock and pop. In addition to performing, Chris is very passionate about teaching music. He maintains a studio of saxophone, clarinet and flute students in Longmont. In addition to private teaching, he often gives masterclasses in schools across the front range area and has presented several lectures and performances at music conferences including the Colorado Music Educators Association annual convention and the North American Saxophone Alliance conference. If you are interested in studying saxophone, flute or clarinet with Chris, or would like to book him for your next event, please see the Contact page.